LAS VEGAS –Las Vegas unveiled its revolutionary trade show booth Vegas Interactive, at IMEX America today, the largest meetings and convention trade show in the country. The trade show booth features an interactive video wall that allows users to access detailed information about hotel, convention and event spaces through the power of touch-screen technology. Vegas Interactive features four, 55-inch touch screens with more than 4,000 pieces of content including 360-degree videos, time lapse photography and still images for guests to experience the destination through an interactive map. Each resort, venue or attraction is designed to showcase meeting space, event venues, dining options, room product, amenities, entertainment and more. The LVCVA developed the trade show booth over the past year in partnership with Inhance Digital, a leader in the technology industry. As the No. 1 trade show destination for 22 years running and one of the most popular travel destinations in the world welcoming more than 42 million visitors annually, Las Vegas’ competitive trade show presence reflects the total offerings of the destination, ensuring the first interaction stands apart and remains top of mind following the show. Aside from being scalable from an interactive wall mural to an individual touch screen device, the trade show booth’s interactive map has the capability to be versatile and mobile. It was created to be used at events of any size, in any location all around the world. For international events, the intuitive design of the booth paired with the imaged-based content eliminates the need to translate pages of text depending on the location and audience. 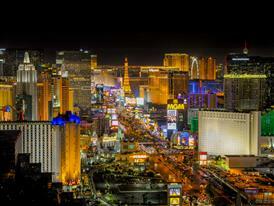 Las Vegas has been a leader in innovative destination marketing. In addition to experiencing the images and videos through Vegas Interactive, potential visitors can also access 360-degree videos of the destination through Las Vegas’ virtual reality mobile app, Vegas VR. When using Vegas VR, consumers are directly connected with a series of 24 original interactive videos creating immersive virtual reality experiences when used with a VR Viewer compatible with smartphones, such as Google Cardboard. The Las Vegas Convention and Visitors Authority (LVCVA) is charged with marketing Southern Nevada as a tourism and convention destination worldwide, and also with operating the Las Vegas Convention Center and Cashman Center. With nearly 150,000 hotel rooms in Las Vegas alone and more than 11 million square feet of meeting and exhibit space citywide, the LVCVA's mission centers on attracting ever increasing numbers of leisure and business visitors to the area. Download the virtual reality app, Vegas VR, to experience Las Vegas from your iPhone or Android by visiting http://www.vrtv.vegas/. For more information, go to www.lvcva.com or www.lasvegas.com.